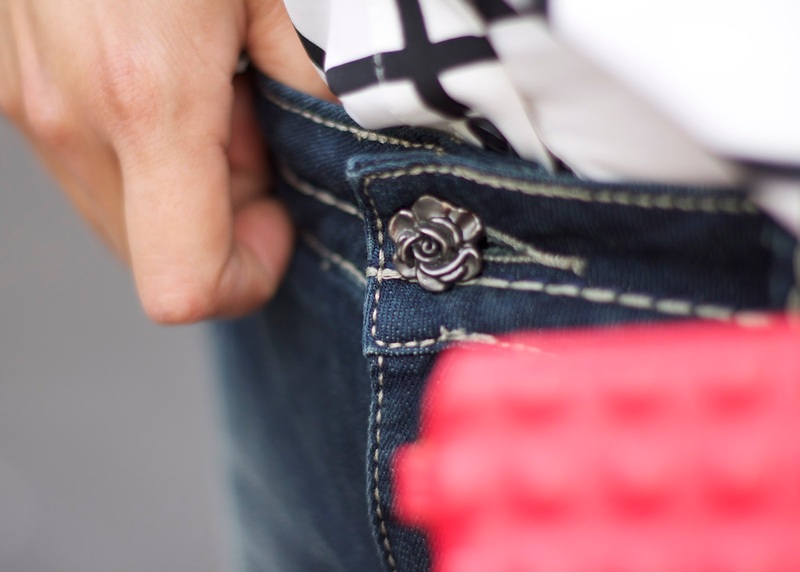 Admittedly, I have a love-hate relationship with jeans because of my "rump" and also because I tend to be a *cough* yo-yo dieter, but this Rose Royce pair fit like a glove and embraced my booty! I liked the cute little touches of sparkle the jeans have for that glam-feel, so I added some metallic accessories to match. I paired it up with this bold grid blouse (last seen here) that I absolutely love, and after seeing Giuliana Rancic wearing a bold grid dress on E! News, it confirmed my belief that yes, grid is still in! This outfit is part of Rose Royce's Fashion Blogger Ambassador Competition where the winner will be sent to LuckyFabb NYC! I would greatly appreciate if you vote for me here (you can vote once every hour). About the Outfit: Rose Royce Jeans, Forever21 "Grid" Print Button-Up, F21 Clutch (similar), Target Silver Shoes, H&M Necklace (similar). How beautiful you look sweety. I love your top. Those jeans look great on you and I love your blouse! You look beautiful! I love that every single one of your looks are perfectly styled and fabulous. You have something about you that makes every outfit look so expensive. Is that a weird thing to say? When I saw this shirt you're wearing, for example, I was surprised to see that it was from F21. I could have sworn it cost you at least $200 more. And the shoes you're wearing...from Target? You're killing me :) They look amazing with this look. So beautiful! I just love those metallic shoes. They look so pretty! Oh I have the same kind of relationship with jeans, sometimes they are my besties and others we just don't get along! Love how you played with the proportions, that grid shirt is super chic! Voting for you! Obsessed with that top and clutch! You look amazing! Pau, in love with this look. Feeling inspired! I really love this look! Definitely chic! I absolutely love the blouse! You did an amazing job pairing everything together. 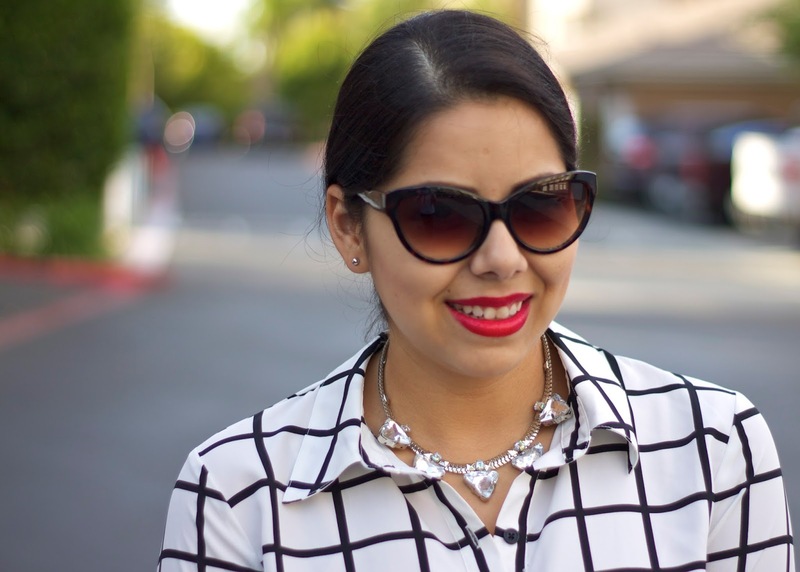 I need to keep my eye open for a grid pattern blouse! That top reminds me of Michael Kors Fall collection! You look sooo chic and gorgeous! I swear you have the cutest style!